After traveling to some of the best North American ski locations last year, I wasn’t sure what to expect from Kirkwood Mountain, but I was excited to discover what this mountain had to offer. Their Communications Manager and honorary mascot “Coop” talked a big game when we met in the early part of the season, but I was still waiting to see the terrain for myself. I arrive at Kirkwood in the evening and begin to take it all in before the first day of my avalanche training starts. The ski day is over, and as I am walking back from the General Store, I realize it is quiet. Extremely quiet. It feels as though I could hear a pin drop from half a mile away. I take a deep breath in, a smile forms on my face, and I think to myself how much I already love it here. The peace and quiet and the mountain air is a nice vacation for my senses from the noisy polluted air of Los Angeles. There is something else special here, however, I can’t put my finger it on yet. Kirkwood is the rebel of Vail Resorts, the pirate and the outlier within the pristine Vail brand. But that's exactly what is amazing about Vail Resorts, they have been able to incorporate and improve the ski resorts that they acquire into the Vail brand, while simultaneously letting the resorts be themselves. Each resort boasts its own personality, and Kirkwood is nothing other than a skiers resort. Kirkwood is a local’s mountain. It is small, unbelievably small. There is no shopping, no nightlife, not many places to eat, and no busy town like Heavenly or Breckenridge. There are a couple of restaurants/bars, a general store, and small section of condos that are literally a stones throw away from the lifts. The lack of distractions leaves room for the mountain to be the star of the show. Kirkwood is for skiing and riding, and that alone. This is what makes the skiers at Kirkwood some of the most talented I have seen. It is place that you visit to ski, not a resort where you come to ski and do 100 other mildly-related winter activities. This is just the beginning of why this place is a true gem. To say that Kirkwood has been getting dumped on this season would be an understatement. The terrain is steep and the snow is deep. With all of that steep and deep, Kirkwood has the perfect avalanche safety training ground. This is why I chose Kirkwood Mountain specifically to advance my skiing skills by taking the AIARE (American Institute for Avalanche Research and Education) taught by Expedition Kirkwood. As someone who has skied for 25 years, I felt that I had done it all. I was a ski racer in high school, I have booted my way up to the top of the Imperial lift at Breckenridge and skied the “expert terrain” of the Lake Chutes, and ten years ago I hit the back bowls at Vail on a powder day. As an adventurous traveler, and like most avid skiers, I am always asking myself “whats next”? The answer is, The Backcountry. Skiing is a personal sport, where you are always trying to push the next limit. Today’s skiers are looking for more. More adventure, more fresh pow, more vertical, more of a workout, more, more more. They are also looking for less. Less skiers to share the mountain with. This is why backcountry skiing has been growing exponentially over the last decade or more. 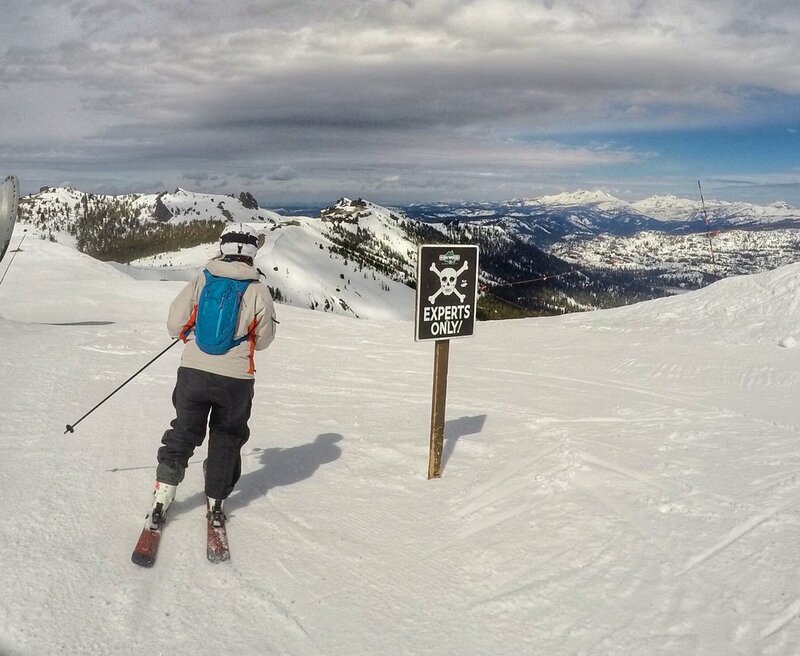 I spoke with Geoff, my AIARE instructor at Kirkwood, about the growth of Backcountry skiing. He has seen growth at a rate of at least 25x since the late ‘70s when he became an avid backcountry skier. Just over the past several years, its popularity has really picked up speed. If you are an adventurous skier, you know that backcountry skiing has been gaining popularity over the past several years. Just look at the adventure influencers that are all over social media outlets like Instagram. Influencers and bloggers have an influence on the decisions of their audiences' future travel plans. These influencers have helped increase the awareness of adventurous activities, specifically skiing in the backcountry. With all that fresh pow out of the ski resort’s bounds, Backcountry skiing is here to stay. The problem is most people that decided to start backcountry skiing are not properly trained. This can get them (and others around them) into a whole lot of trouble. Just because you are a great skier when you are at the resort does not mean you have a clue about the dangers of the backcountry. The backcountry is a whole different animal. This is why it is so important to be educated on the hazards of the backcountry, and why I chose to take the AIARE Level 1 Avalanche Course. The AIARE Level 1 course teaches decision making, and teamwork. Our small group of 9 at Kirkwood worked together to ask questions and solve problems. We learned what causes an avalanche, and what to look for. Together, we learned to use receivers and practiced rescuing in an organized fashion. We communicated, we dug through snow packs to search for weak layers, and we challenged each other and our instructor with difficult questions. We skied around the mountain discussing slope angles and escape routes of avalanche terrain. Kirkwood is the perfect place to take a course like this because the terrain that you are working with is avalanche terrain so you can see the different types of zones in real life as opposed to just in a classroom. This hands on approach will help understanding and improve confidence upon completion of the course. With this course under my belt, I now feel confident in my abilities to make safe group decisions in the backcountry, as well as successfully carrying out a rescue should an avalanche ever occur. Kirkwood isn’t just about the backcountry, the skiing and the avalanche prevention. Kirkwood is incredible because of the people who built the resort. The people who visit time and time again, and the close knit community that has just as much significance to Kirkwood as the mountain does. Kirkwood is a community, one that will welcome you with open arms. The terrain will challenge you, the people will teach you. When you arrive at Kirkwood, you aren't just arriving at another ski mountain. You are arriving at a home. The locals will welcome you as apart of the family and not as a tourist. The mountain will greet you with sunshine and present some of the most exciting ski terrain for you. The classes at Expedition Kirkwood will teach you skills you will have for a lifetime. The Kirkwood family will tell you stories of how the trails earned their names, and speak of the ones who came before you to build this mountain, with nothing more than a love for the outdoors and a passion for skiing. Visiting Kirkwood isn't a one-time, notch in your ski bibs type of trip. Kirkwood is a place you will want to return to more than once. This place will leave marks on your soul that will force you to revisit again and again. As the car taking me away from Kirkwood drove through the mazes of oversized snowbanks toward Lake Tahoe, I knew I would be back before I knew it!